Presents the a QtopiaServiceSelector for the user to select a service performed, and also asks for an input to associate with it. Removes the Speed Dial entry at the given row. The action is not removed from Favorite Services. 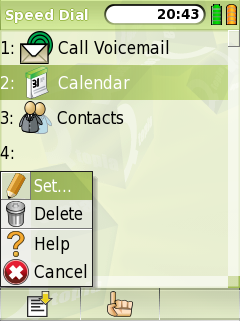 Removes the Speed Dial entry at the currently selected row. The action is not removed from Favorite Services. Presents the a QtopiaServiceSelector for the user to select a service performed for the same input. Selects the row from the list that corresponds to the Speed Dial input. If there is no such row then it will go the the one before where it would be.